Week 14 was pretty eventful for us. The first half of the week was dominated by a sick kiddo. Super high fever for 3+ days. This was stressful enough of its own. But especially more stressful as Chris and I were planning our first kid-free getaway since Tilly was born. I used Midnight Edition exclusively for this week. I liked sticking with this more neutral core kit for this week. This is a favorite kit of mine that I really don't use enough. I whittled down my core kits the past few weeks and there are two kits that I refused to sell any cards from. Deena Rutter's Coral Edition and this beautiful Midnight Edition. With Matilda's fever mostly staying away on Friday we stuck with our plans and flew out of town to Healdsburg (our former home!) in Sonoma County California. So fun to visit with friends we hadn't seen for 2 years, drink great wine, eat great food and laugh and laugh and laugh. For the watercolor photo I used the iPhone app Waterlogue. 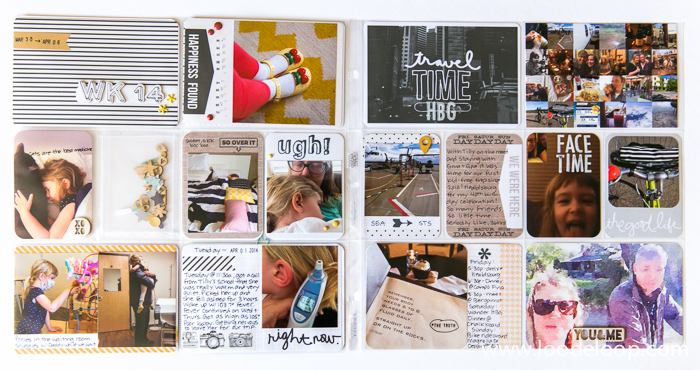 Such a fun way to edit photos for Project Life! This is a photo of us on a bike ride checking out our old house in the vineyard. You may be seeing more of these watercolor photos in future layouts. I was OK with the teeny tiny photos for the trip since I am planning on using one of the little Instagram photo albums to include all of the photos in. More on that later. So, that's a wrap! A little late for me... but now I can roll right in to Week 15! Thanks for stopping by. Agree with you - I love, and currently use the Coral Edition and still want to try Midnight. Sick kiddo just before your 1 st get-away- happened to me too! Great page! Thanks for your comments! It's like those kiddos are on to us trying to have a peaceful getaway, huh? Stinkers.